I won't be able to head up to Rhode Island Saturday, our cat is having surgery and can't be left home alone afterwards. Our cats are basically like our children, gotta look out for their well being. 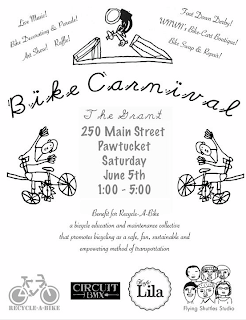 I encourage people to still head on up to the Bike Carnival, sounds super fun!! 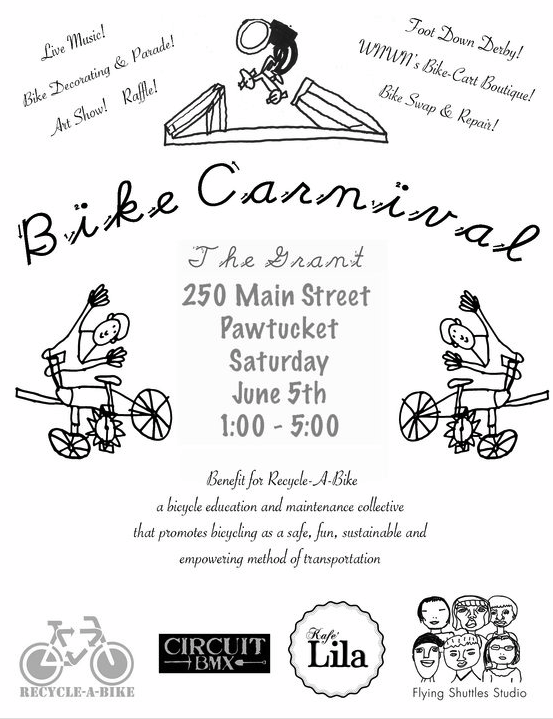 So a bunch of us will be headed up to Rhode Island next Saturday, June 5th! 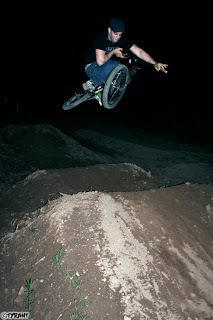 We're going to get in an early morning session at the cement park and then hit up this Bike Carnival thing Vic from Circuit has been hyping up. Damn, it's currently 85 out and it looks like the next 3 days are going to be the same. Summer is right around the corner boys and girls. The only true way to beat the heat?...pond jumping!!! I spent 6 hours at The Lot yesterday and a solid 2 of those hours were spent helping Dave modify the bridge drop. The drop is no longer, it's a cannon now. There is a new back stretch to the rollers line in the works and the kickers have bee repositioned for maximum boost! The place is coming along real nice! If you don't know about the Chee read these posts first! 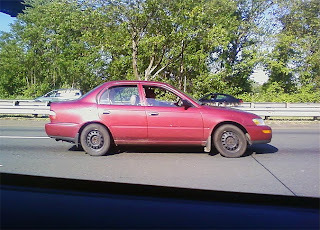 So I saw Bob on the highway yesterday and the Chee is still alive! Still rocking the TYRANT stickers, no hubs caps, and looking a bit dirty...but she's alive! Bob texted me to let me know the Chee is at 263,000 miles...and still rolling along. Epic! I swear I'm gonna buy that thing back from him one day!!! With the help of a Bobcat and a back hoe The Lot should is getting a kick a$$ face lift this weekend. 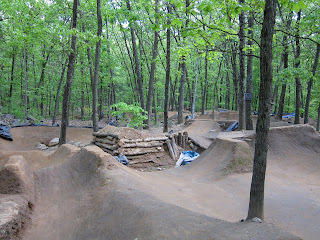 New jumps, revamped bridge drop, pump track, etc. Supposed to be a gorgeous weekend too, should be great! This morning I was clearing off some old TYRANT files I had stored on my iPod and came across the below image. 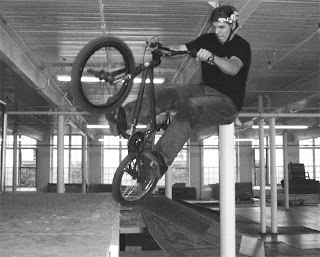 Crabb shot this sub-box fuf photo of me at the Chicopee Warehouse back in 2004. 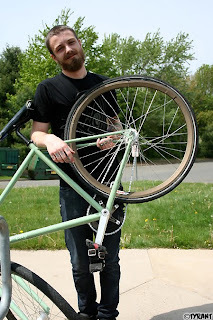 Check out the old Stricker frame and 36 T sprocket! Man I miss the old warehouse! These new Lot inspired tees are being screened late next week and will be available in early June!..and easy on the wallet at $10!! I slung dirt for an hour at The Lot last night and then Bry came up and we rode the rollers section till it was pitch black out. I'm hoping the inch+ of rain tonight helps pack in the new triple roller/I-beam line and the fresh dirt added to the berm. It looks like Blachura is gonna have a Bobcat up there Wednesday getting the small line dialed in and making a new roller, table, roller alternating line. Should be gnarly! A gate is also going up at The Lot so all the uninvited guest stay the hell out! The first Lot Jam of 2010 went off yesterday and it was a good time as usual. It was a pretty slow afternoon...people really didn't start trickling in till 5ish. Steve, Schmidt, Brandon, Sean, and I dug, raked, and rode from 11-3 till the first people arrived. 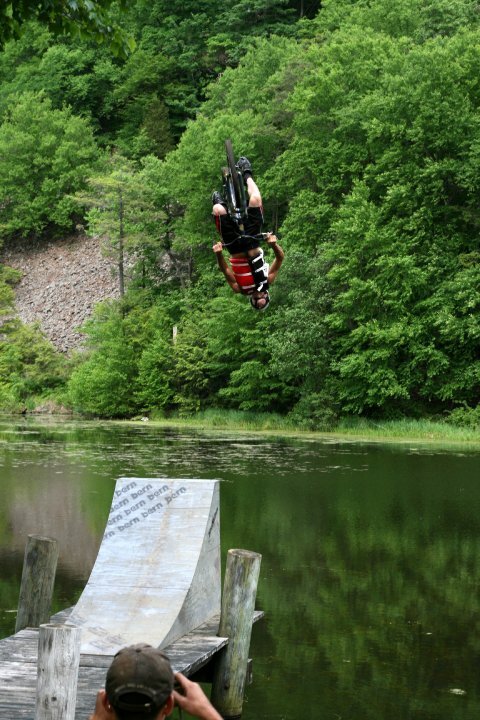 We touched up all the jumps and built a new triple roller to I-beam cannon...which can be grinded or ridden. Fun as hell! 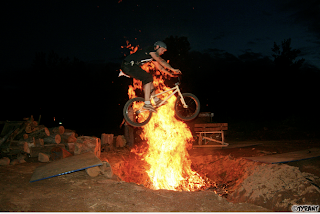 It was a typical Lot Jam...bikes and motos, people hanging out, pizza, fire, dirt and good times! Next Jam should be sometime in mid-June...I'll have a date as soon as things are finalized! Last night I made some upgrades to my bike. I put on the newly acquired stem and wheel set and took off the pegs and hub guards. My ride weighs in at 25 lbs. even. That's 1.35 lbs. less than it was!! Pretty light for such a beast of a bike! Before you talk sh1t saying that is heavy, remember I ride a 22" MacNeil Deuce Deuce with 48 spoke triple wall Alex Supra J rims. Factor in the 14mm hubs front and rear and 2.25" tires and that makes my wheels nearly 8 lbs. alone! Gotta keep it bomb proof!! 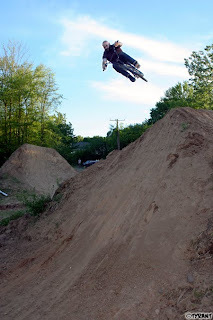 Last nights session at The Lot was pretty insane! People were riding their a$$es off and some after dark debauchery took place. Woo hoo! Evan Huggerd showed up to The Lot yesterday and it was like Christmas. Everyone knows Evan's bike is always in tip top shape and looking pristine and you never see a scratch on anything the dude runs. Well, Evan was clearing out some of his old parts from his trunk...old as in 6 months and still mint...and Steve and I got hooked up! 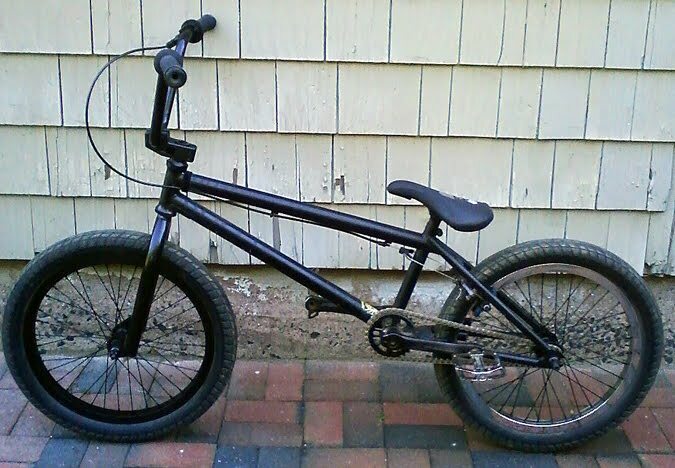 Steve got a set of chrome Slam Bars and I ended up with this FIT D.L.T. stem. 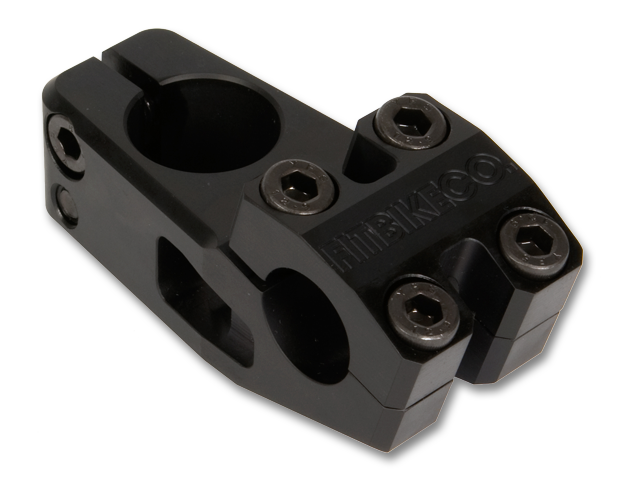 So psyched on new, free parts! Thanks a bunch dude! Evan has been on the DL for some time know due to a shoulder injury he suffered at work. Get well soon! Hope to see you back on the bike for good soon! As most of you know Dave Blachura is getting hooked up from Bern Helmets. Well thanks to Dave's connections at Bern most of the TYRANT crew is now rocking new BERN dome protection. Thanks guys! If you don't know about Bern do some research! Their helmets are rad as hell and there pads kick a$$ too! We rode The Lot last night and the place was insanely dusty. Fortunately it's supposed to rain like hell today so the jumps should get some much needed moisture. Steve dug a burly new right hip off the 2nd lander that leads into a double over the moto table top. When it's packed in it's going to be a sweet line. 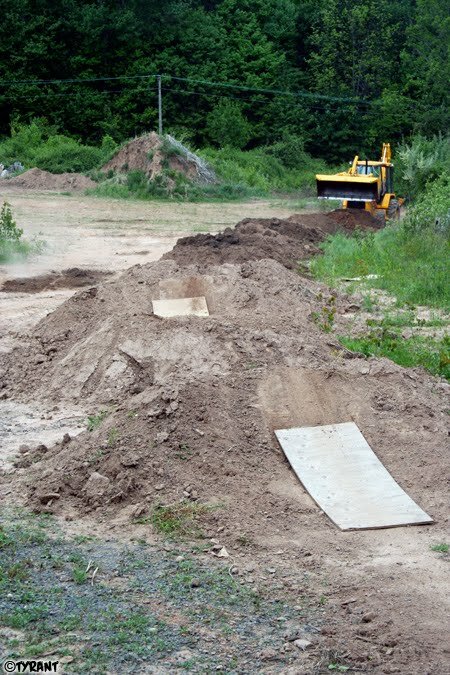 We also started working on a new snake berm which we plan on tying into a pump track. No gaps...all speed rollers, tables, and berms! 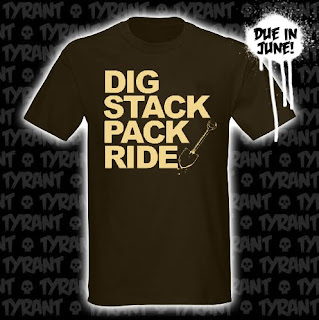 The plan is to head back on Thursday to sling some more dirt and pack in the new stuff. Yesterday's visit to The Lot was so strange! The first incident of the day was some random old guy who lives in the neighborhood just driving down to The Lot on his full size tractor and dumping the bucket that was full of grass clippings and dirt. After confronting him and asking what the hell he was doing it appears he thought some guy he knew owns the property, which we all thought was BS. He claimed he could dump there and take top soil whenever he wanted. So, that's where the soil has been going! I think he got the message that he wasn't welcomed and I doubt he'll be back. The 2nd incident of the day was when we discovered that somebody is living in the woods beside The Lot. Who ever the person(s) are they are not roughing it! Full on tents, folding table and chairs, grill, etc. Well after much discussion we decided to call the cops because the camp site was on the private lot property and there was some questionable stuff in the squatters stuff. Long story short, the cops came and were pretty shocked, but really couldn't do anything cause the person(s) were not there. Notes were left saying that the area needed to be vacated in the next 5 days...cause it'd take at least that long to walk all that sh1t out of there!!! We'll see what happens Friday the 14th when the area is supposed to be cleared out. Besides that BS it was a fun day of building and riding. 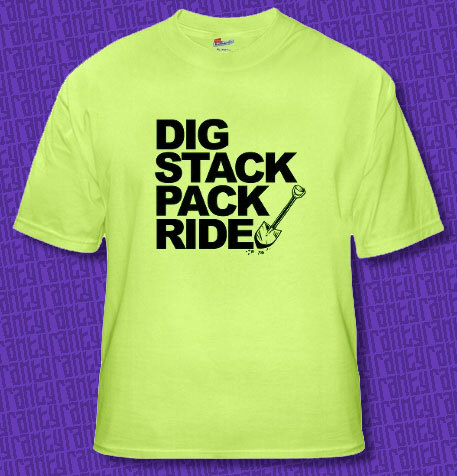 Blachura was running the backhoe working on the mini 20 pack super rhythm section. We did some riding of the mini set and the big line and then the pit bike crew started getting rad on their mini motor bikes. 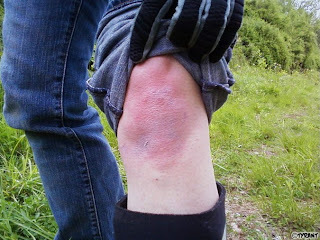 T took a nice digger and did a number on her knee! Despite that injury it was definitely a fun day! Hilarious to see that my blog post got people heated enough to write me e-mails, texts, and leave comments supporting Parkour. Dan, whoever you are, thanks for the novel of an e-mail. Out of respect, I won't post and openly mock the entire thing...but I will say you have way to much time on your hands! Good luck to you and your new Parkour shoes! Oh man, Parkour...I'm pretty sure if you look it up in the dictionary it says "idiots pretending to be SpiderMan". To each their own, I typically don't bash people's activities, but man these guys are a bunch of kooks! Sure, Jackie Chan and cat burglars have been doing it for years, and some of these guys are amazing...but really, is Parkour gonna be a varsity sport now! 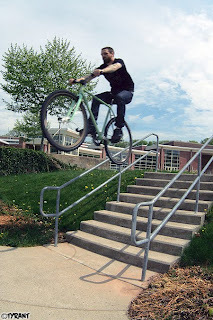 Over the years we've been harassed at numerous locations around Middletown for riding street. Seriously, we're riding bicycles...we're not bothering anybody! Well in the past few weeks I've seen this crew of Parkour dorks climbing on walls and buildings practicing their craft or whatever the hell you wanna call it. What really got me heated was when a security guard at a local M-Town building we ALWAYS get kicked out of for riding near was in awe by these guys climbing on the side of the building and didn't even harass them. Hell, he was encouraging them to do bigger stuff. The way I see it if you're climbing up the side of the building at 10 at night the average person is gonna think you're attempting to get in and rob the place! If you're riding a bike at 10 at night...well, you're riding a bike. Half the time we're not even on the property, we're on the sidewalk or walkway out front...not on the damn building!! Basically I'm just ranting cause it gets me heated that these tools are chimpping all around down town literally ON peoples property and we're still getting harassed for riding bicycles. LAME! I rode the Belltown Park solo under the lights for almost an hour last night, I couldn't believe the place was empty! I got a few texts from people saying they might come through and sure enough a few heads showed up. Justin and Reed came down from the Manchester area and Jake came across from Newington, both pretty long drives to ride the little Belltown park. It was cool to see out of towners who haven't seen the park before into the set-up. Justin was psyched on the spine and emptying his bad of trick on/over it. Reed has never ridden a legit street spine and was a bit hesitant at first, but was boosting it in no time. Jake tried an abubaca on the new wallride/sub late in the night about a dozen times losing it on the last 5 feet of the rollback numerous times. He may not of pulled it clean, but it was burly!...and knowing him that will be the first thing he lands the next time he shows up. We ended up riding till the lights went off at 10 and it was a fun, low key session. Thanks for coming out guys. 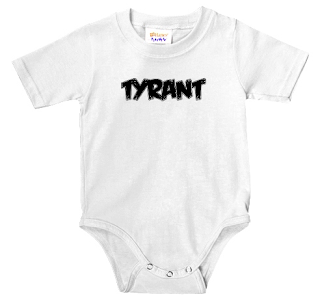 Check out the new kiddie threads over on the TYRANT CafePress. Gotta send a shout to Wethersfield ripper Sal C., congrats on the new little boy! Gotta start 'em young! I got word that Vertigo Skatepark is now letting bikes in the park on Wednesdays from 5-10PM...but you have to "call for details". I haven't called yet, but I'm assuming no pegs, or only plastic pegs and pedals permitted, and I bet the price is inflated. There is also no mention on their website yet. 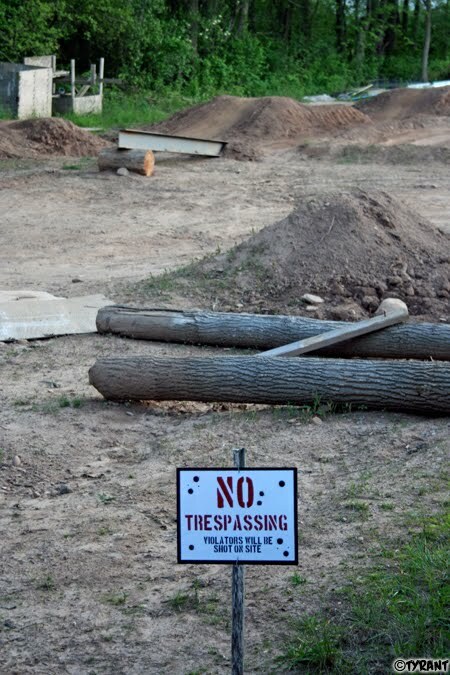 It's been 3 years since the park opened and bikes have been banned since the start. Deja Vu anyone? 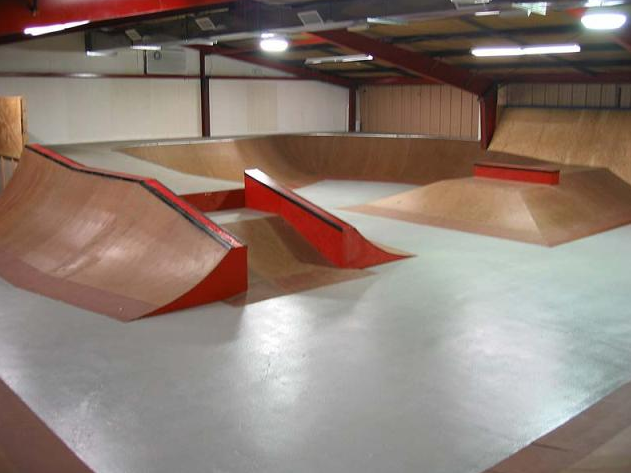 I kinda get the feeling they're pulling an Academy Skatepark move here, hoping to pull in some more cash by letting the bikes in once a week...but that's just me. Brookfield isn't exactly right around for us, it's at least an hour drive, but I'm sure we'll hit the place up at least once this Summer. Super fun session at The Lot last night. The new 12 pack small line is pretty dialed, kinda has a pump track feel to it (see 1st 6 pack below). 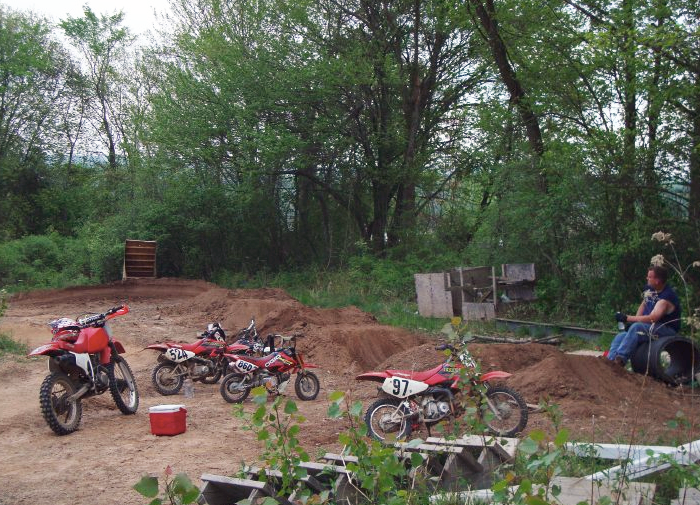 The main use for it is going to be the guys riding their 50/70cc pit bikes, but it's totally bike worthy as well. The guys were going off on the big line, the clouds were pretty wild, and the sunset was providing some amazing lighting. Good stuff! I stole this photo from Dan Perry's Facebook! Welcome to the rabbit hole! Click on the link below to go to Prolly's blog, to link back to here, to repeat again! Yeah Sean! Thanks John! 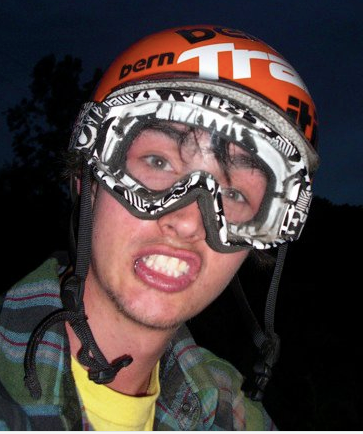 Brandon's been at is again, filming himself getting rad on the 20". So psyched on the way this little dude is progressing. Video contains a few clips from our Sunday session this past weekend. Good stuff!!! Web Video 9: Springtime from Brandon Begin on Vimeo. It's official boys and girls...so I can spill the beans now...Sean Milnes is riding for All City. Hell yeah, we're psyched for you dude! Congrats! No worries, Sean will still be rocking TYRANT threads riding locally with the crew. Super pscyhed! Craig Sameuls film, Luminous Flow, has been accepted into the 2010 Bicycle Film Festival in New York City. We'll have a crew of us heading down to view Craig's film and raise some hell in the city. Congrats Craig, this is HUGE!!! Damn it was hot yesterday...and humid too! Sean Milnes, Brandon, and I met up to ride the Belltown Park for a bit and hit up some street spots. 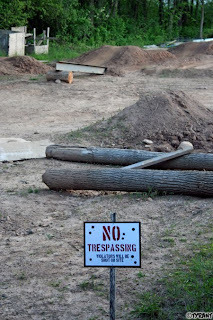 Sean decided to go big and huck an 8 stair set near my place and blew his back wheel to oblivion! Props to Sean though, he cleared the set and rode it out with a destroyed back wheel flopping around under him! Brandon launched the same set and threw the bars making it the biggest set he's ever bar spinned over. Pretty burly! After the stair session we scooped up Arnwine and headed down to Sean's house in New Haven to drop off the blown up fixie, get his BMX, and ride some street. It was a super hot, mellow session riding around the city shooting at a few spots here and there. Sean was a great tour guide and brought us to some rad spots. Good times in the Elm City with good friends!